An evening for adults only . 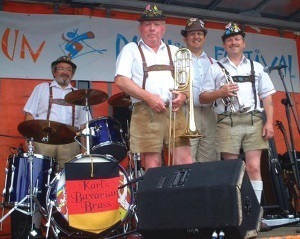 Join us for a foot stomping, stein bashing Bavarian music night featuring one of the UK’s premier Oompah bands - “Karls Bavarian brass band”. This loveable group have been entertaining audiences with their own unique style for many years. They incorporate traditional German music with some rib tickling games that will get you laughing in the aisles...A night not to be missed!!! Price includes a one course themed supper.